"When I got both calls I didn't even… I flipped over my hand and I didn't even stay to see what they had," he said. "I went straight to my rail and looked up at the TV and they had set up pocket kings and my aces. And, somehow, this is real life." Hand #171: Nicolas Manion continued his aggression in the very next hand and opened to 1,500,000 first to act. Antoine Labat called in middle position and Yueqi Zhu moved all in for 24,700,000 from the hijack. Once the action was back on Manion, he announced all in himself for more than 43,100,000 and Labat asked for a count. 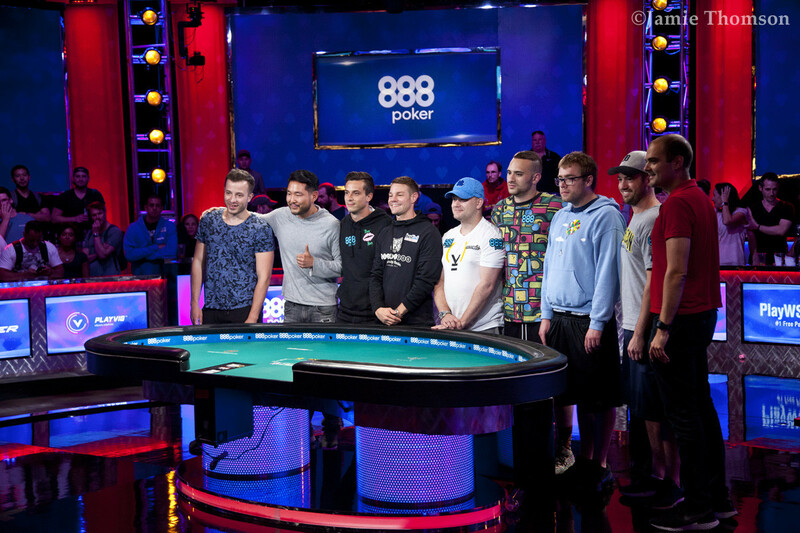 By then, the rail was already about to implode, and things got even more intense as soon as Labat announced the call as the biggest stack of the trio. Labat had two live suits to knock out both opponents and picked up some hope on the flop, as the entire Thunderdome was filled with shouts from every corner. The turn locked up the hand, making the river a formality. 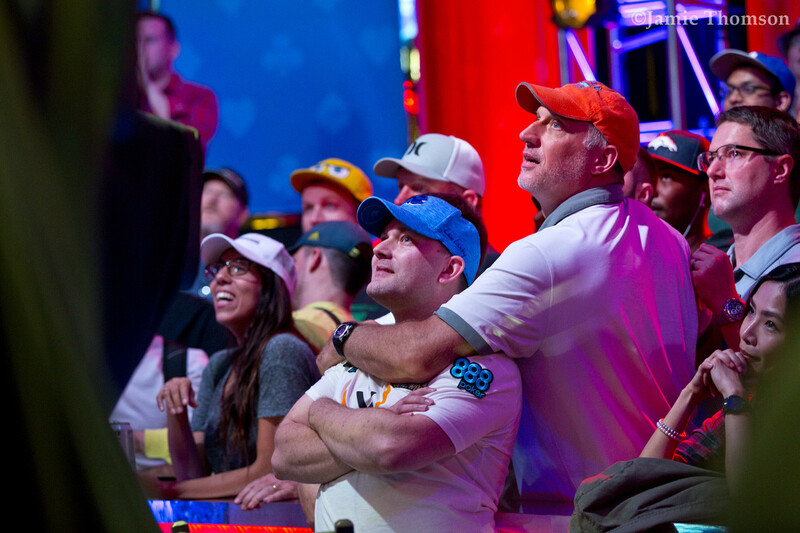 Manion's rail exploded into cheers as their hero won the hand to scoop the monster pot and take the chip lead. 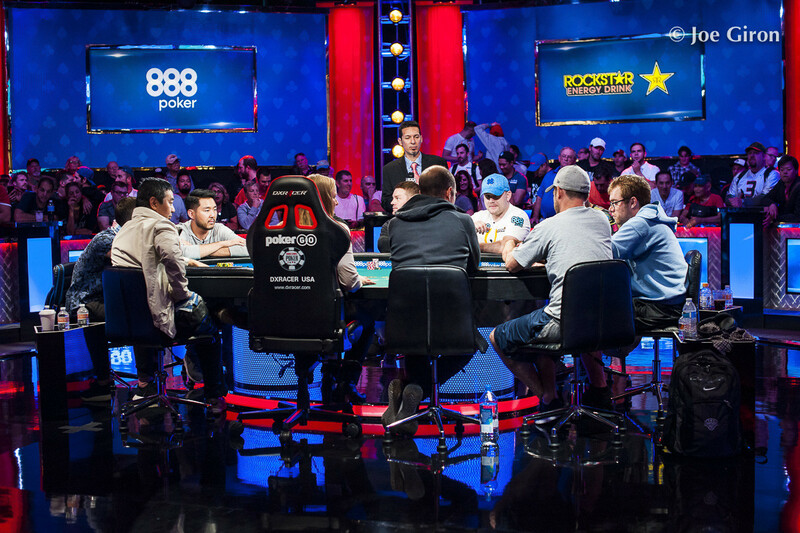 Zhu came up agonisingly short of the official final table, finishing in 10th place for $850,025, while Labat will have a mountain to climb with just 13 big blinds for the official nine-handed final table. The official counts will be published shortly, along with a recap of today's action. Hand #170: Tony Miles made it 1,400,000 to go and Nicolas Manion called from one seat over, as did Michael Dyer. On the three-way flop of , Miles continued for 2,600,000 right away and Manion raised it up to 7,000,000. Dyer folded instantly and Miles gave it some thought before coming to the same conclusion. Born in Benxi, China but now residing in Rowland Heights, California, the 55-year-old Yueqi "Rich" Zhu is no stranger to poker. 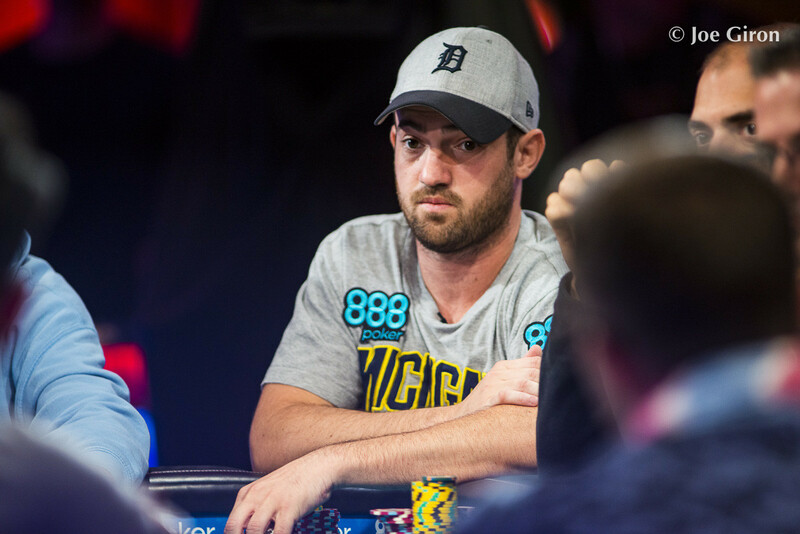 Not including what he makes in the 2018 World Series of Poker Main Event, he has $1,456,884 in prior WSOP earnings. Zhu tends to only play tournaments during the WSOP, while the rest of the year he's busy working and grinding cash games. In the 1990s, Zhu immigrated from China to study at the University of Wisconsin, which is where he got his Bachelor's Degree in electrical engineering. For as long as he remembers he's fancied both card and board games. 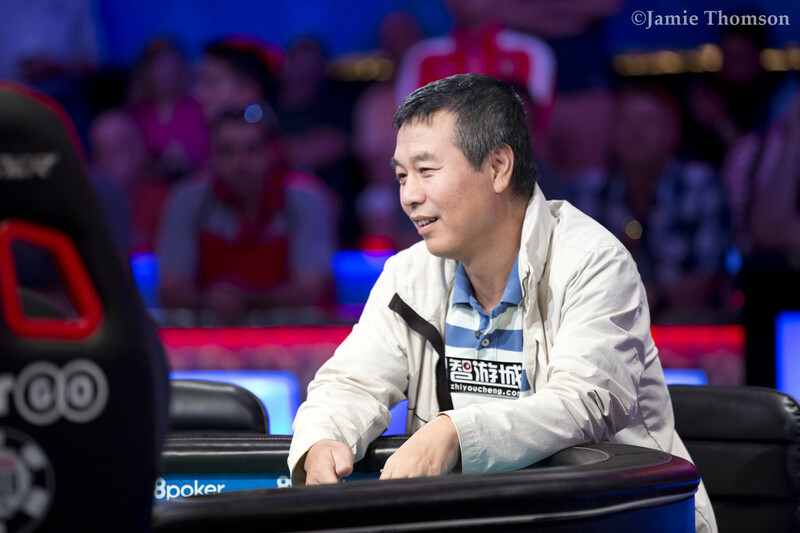 A self-described "semi-pro,' Zhu has one son, though he doesn't know much about poker. "My son, my family, they don't play poker," he explained. "They don't want to watch poker except probably for the past couple days." 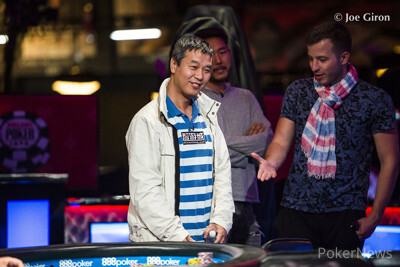 Zhu, who has promoted poker in China for decades via forums and magazines, finally broke through with a bracelet win earlier this summer after 11 final table appearances and 71 cashes dating back to the 1999 WSOP. His win came over a 773-player field in Event #35: Mixed $1,500 PLO8, Omaha Hi-Lo 8 or Better, Big O for $211,781. It came after he finished sixth in the same event the year before. "I saw a lot of people get bracelets, it seemed so easy, no matter what they do they win," said Zhu. "But for me it was a different story. Finally, I got one." Even before his Main Event run, Zhu was planning a book to help introduce poker to the Chinese market. Obviously making the final table of the WSOP Main Event would obviously provide a happy ending to such a book. "Poker in China, over the last 15 years, has gone from almost nothing to into the mainstream," said Zhu, who makes frequent trips back to his homeland. "It's going really fast. From my part, we have a lot of people working on promoting poker because in my mind, for card games, I feel American poker is the best. 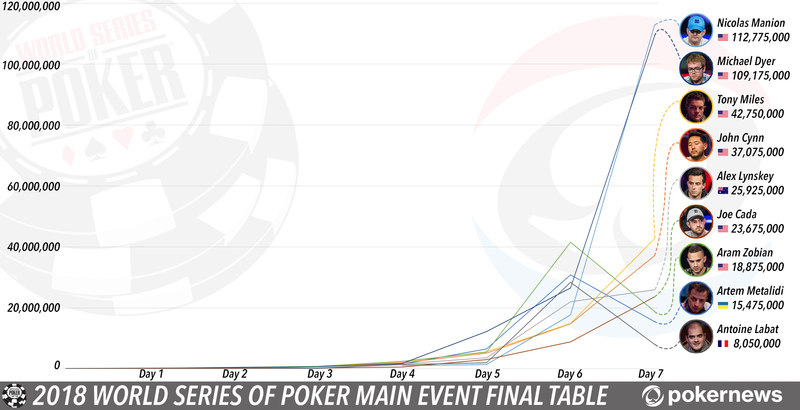 For myself, I started a poker forum that is generally regarded as the most respected in the Chinese world. I also have a poker magazine and we published like 70 issues in a seven-year time frame." Yueqi Zhu at the feature table. "I've had a few really good reads," Zhu said when asked about big moments in the tournament. "On Day 4, a guy put me all in with on the board. He was the preflop raiser, so he could have easily had an ace or nine. I called for all my chips with a set of kings. He didn't have the straight. I could've easily busted that hand." He continued: "The next day, someone tried to bluff me but I snap-called him with two small pair. It was for my tournament life." Another hand that helped Zhu along the way happened on Day 7 with 12 players left. Zhu raised with ace-ten suited and then called when Frederik Brink jammed 4.1 million with king-queen suited. Zhu was a slight favorite and held after the board ran out clean to vault him up to 35.7 million in chips. Follow Yueqi Zhu on Twitter @yueqizhu. Hand #168: Alex Lynskey opened to 1,200,000 from early position and action folded around to the button where Antoine Labat called. Yueqi Zhu called in the small blind and in the blind Artem Metalidi folded. The flop was and Zhu checked. Lynskey checked as well. Labat put out a bet of 2,200,000 and Zhu called. Lynskey folded. On the turn, Zhu checked, as did Labat. The river was the and Zhu checked again. Labat checked as well Zhu showed for ace-high, but Labat had that matched with for the same hand, so the two chopped the pot. Hand #169: Action folded around and John Cynn got a walk in the big blind. Hand #166: Aram Zobian made it 1,300,000 to go from the cutoff and that scooped the blinds and antes without resistance. Hand #167: John Cynn raised to 1,300,000 from early position and Tony Miles three-bet to 4,000,000 from two seats over. The action folded back to Cynn, who called after some consideration. 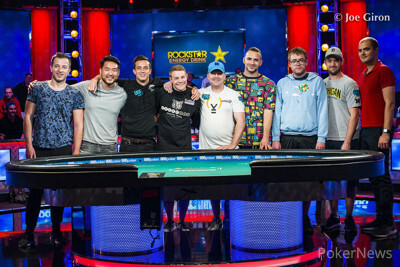 The flop brought a check from Cynn and a continuation bet of 3,200,000 by Miles, which ended up winning the hand without showdown after the fold of Cynn. Hand #164: Joe Cada opened with a raise under the gun to 1,300,000. Joe Cynn called from middle position. Action folded around and Michael Dyer called in the big blind as well. The flop was . Dyer led out with a bet of 1,175,000 and Cada folded quickly. Cynn called. On the turn both players checked and the came on the river. Dyer put out a bet of 1,825,000 and Cynn called. Dyer showed his for two pair and that was good for him to take down the pot as Cynn's hand was mucked. 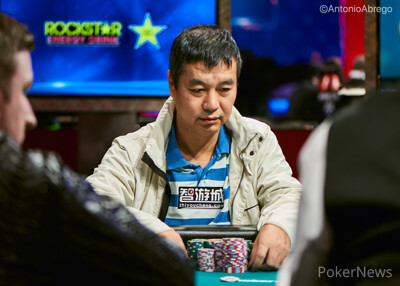 Hand #165: John Cynn opened to 1,300,000 and everyone folded, so Cynn took down the pot. 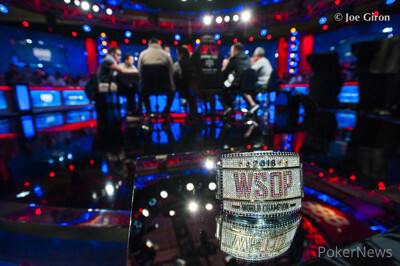 After Day 1C of the 2018 World Series of Poker Main Event, which started players with 50,000, former champ Joe Cada bagged up just 16,500. He was near the button of the counts. Obviously, you can call it a comeback as he now finds himself among the final ten. It marks the second time he's been in this spot as back in 2009 he topped a field of 6,494 players to win the 2009 WSOP Main Event for $8,547,044. At the time, he was 21 years, 11 months old and became the youngest player in WSOP history to win the Main Event. 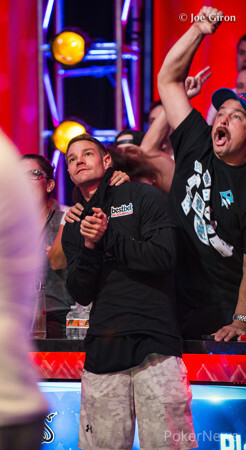 Not only that, he did it by besting a final table that included Phil Ivey, Jeff Shulman and Darvin Moon. The other headline he grabbed was around Father's Day, which is when he put his father, Jerry Cada, into the $1,000 Super Seniors Championship. The story was heartwarming as not long before Jerry spent over a month in a coma after suffering a stroke. During his recovery, Joe spent time teaching his dad the poker ropes. Joe was on his dad's rail, but now it's time for the father to root on son once again. 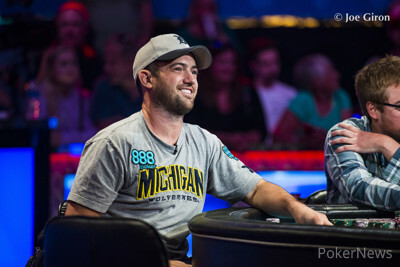 2009 WSOP Main Event champ Joe Cada. One of Cada's pivotal hands came with 15 players remaining in Level 34 (200,000/400,000/50,000) when he three-bet jammed for 6.875 million holding ac-six suited. The initial raiser, Frederik Brink, called with ace-ten and Cada was in trouble. Fortunately for him, the board ran out with three hearts, including one on the river, to give him new life. In another big hand, Cada executed a three-barrel bluff against Alex Lynskey, who had flopped top pair on a king-high board. Cada's river shove sent his Australian foe into the tank and eventually, he folded. Cada's brazen bluff lit up the Twitterverse and showed that he was willing to put it all on the line for another shot at the title. If Cada were to win the Main Event, he would join the ranks of Johnny Moss, Doyle Brunson, Johnny Chan, and Stu Ungar as repeat winners. Similarly, a fourth bracelet would put him in company that includes Michael "The Grinder" Mizrachi, Brian Rast, and Amarillo Slim Preston, just to name a few. Finally, Cada is the first Main Event champ to return to the final table since 1995 winner Dan Harrington went back-to-back in 2003-04. You can follow Cada on Twitter at @cada99. Hand #162: Alex Lynskey raised to 1,200,000 on the button and Tony Miles in the small blind three-bet to 4,600,000. Lynskey called and that created a pot of more than 10 million in the first hand after the break. The flop came and Miles continued for 5,600,000, Lynskey called. The appeared on the turn and Miles instantly announced all in for 20,350,000. Lynskey gave it brief consideration and flicked his cards into the muck. Hand #163: Michael Dyer opened the action with a raise to 1,200,000 first to act. Aram Zobian was the only caller out of the big blind, and the flop fell . Zobian checked and a continuation bet of 1,125,000 did the trick for Dyer, as Zobian let go. The remaining 10 players are heading on a 10-minute break. Hand #160: From under the gun, Tony Miles opened to 1,200,000 before Nicolas Manion three-bet next to act to 4,000,000. The action folded back to Miles, and he flicked his cards to the muck. Hand #161: Michael Dyer opened to 1,000,000 from middle position and Joe Cada called next to act. From the button, John Cynn three-bet to 5,200,000. Dyer folded, as did Cada, and Cynn collected the pot. Hand #158: Aram Zobian opened to 1,200,000 from middle position and picked up the blinds and antes. Hand #159: Michael Dyer raised to 1,000,000 from middle position and John Cynn called from the big blind. 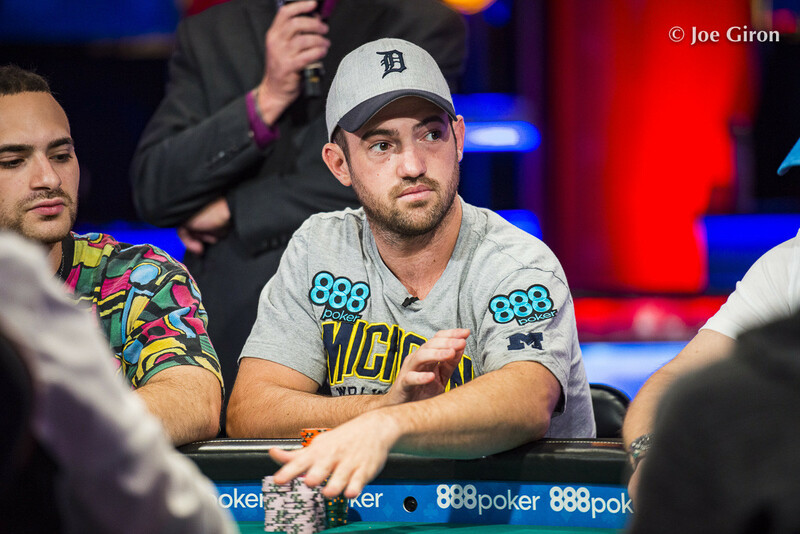 The flop fell and Cynn check-folded to a bet of 925,000 from Dyer. Hand #156: Nicolas Manion opened to 1,200,000 from the hijack and Antoine Labat called in the big blind. The flop landed and Labat led out for 1,700,000 before Manion raised to 4,500,000. Labat went into the tank for roughly two minutes before three-betting to 12,000,000. Manion snap-folded, and Labat collected the pot. Hand #157: From the button, Joe Cada raised to 1,100,000 before Antoine Labat three-bet the small blind to 3,750,000. Cada responded with an all-in for 23,200,000 and Labat snap-folded. Hand #154: Tony Miles raised to 1,200,000 in the cutoff and Aram Zobian called from the small blind along with Michael Dyer in the big blind. The flop of was spread across the table and the action checked around to the on the turn. Zobian checked again and Dyer tossed in a bet of 2,175,000. Miles folded but Zobian stuck around to see the on the river. Zobian checked one more time and Dyer slid in a bet of 6,250,000. Zobian mulled over his decision but eventually threw his cards to the muck. Hand #155: The action folded to Zobian who raised to 1,150,000 on the button and both of the blinds mucked their cards. Hand #152: Michael Dyer opened to 1,000,000 from early position and Alex Lynskey called from the button, as did Nicolas Manion from the big blind. The flop landed and Manion checked over to Dyer who bet 1,325,000. Lynskey called, and Manion called also. The turn fell the and Manion checked, Dyer bet 4,125,000, and both Lynskey and Manion folded. Hand #153: John Cynn opened to 1,100,000 from the hijack and collected the blinds and antes. Hand #150: Michael Dyer opened to 1,000,000 from middle position and Alex Lynskey defended his big blind. The flop fell and Lynskey check-called a bet of 925,000 from Dyer. The turn brought the and both players checked to the on the river. Two more checks and Lynskey showed while Dyer tabled to win the pot. Hand #151: The action folded around to John Cynn who raised it up to 1,100,000 on the button. Tony Miles called from the big blind and the flop came . Miles checked to Cynn who continued for 1,200,000 and Miles made the call. The turn brought the and Miles checked again. Cynn fired another 2,600,000 and Miles check-raised all in for 13,500,000. Cynn quickly called and the cards were tabled. Miles was in the lead with two pair but Cynn had outs to counterfeit him. The dealer burned and turned the on the river and Miles held on for a full double-up.